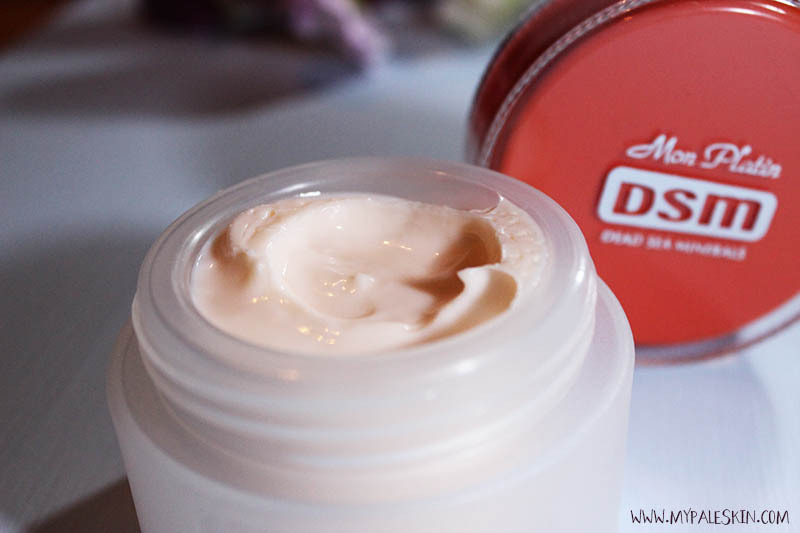 My Pale Skin: DSM Moisurizing Carrot Cream* Review! 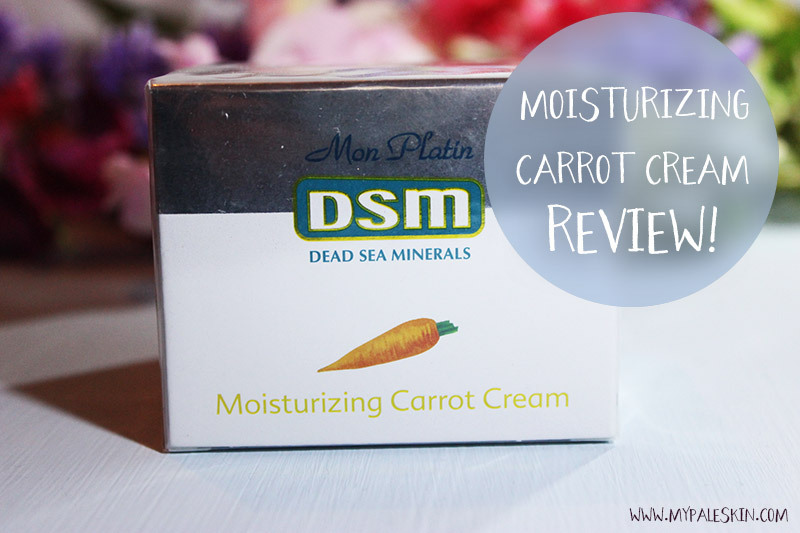 DSM Moisurizing Carrot Cream* Review! Over the past few weeks I've been trying out a new moisturizer. I picked up the Dead Sea Minerals Moistuizing Carrot Cream* from Jojoba Cosmetics at the Professional Beauty London show. At the show, I was fortunate enough to be able to choose any two products from the Jojoba Cosmetics stand and I chose the Honey & Olive Oil Hair Mask as well as this Moisturizing Carrot Cream*. What I liked about this cream is that it contains a whole heap of different vitamins such as vitamins A, E, C, B1 & B2, which help to treat the skin as well as minerals from The Dead Sea which are said to have extensive benefits. Anything that's going to improve my skin is a winner with me. I'm really trying my best this year to up my skincare game and I've put this cream to the test. I wish tub creams came with some sort of spatula or scoop to keep them contaminant free, but I haven't come across one that does so far. The Carrot Cream* comes in a 50ml tub and I'm a fan of the packaging, it makes it feel a lot more special than my typical go to Nivea Cream. The cream has a a pretty smooth consistency and glides onto the skin fairly easily. It's light in texture and easy to apply. I find the Carrot Cream* is absorbed within a minute or two by my skin and doesn't leave a greasy layer on my skin. Since switching to the Moisturizing Carrot Cream* from my Nivea cream I have been surprised at how much my skin has improved. My T Zone is no longer oily and i'm not getting breakouts in that area any more. My skin seems smoother and has generally picked up. However, i'm honestly not sure if that's because i've stopped using Nivea Cream, or because of this new moisturizer. The only way to tell really is to switch back to Nivea for a week or so and i'm hesitant to do that as I'm getting on so well with this one. My Final thoughts are - so far, so good! I've been using it every morning and night and my skin has picked up, with less breakouts and less oil produced! Anything that will be an improvement to my skin is a winner with me so I'm happy to report good findings with this. 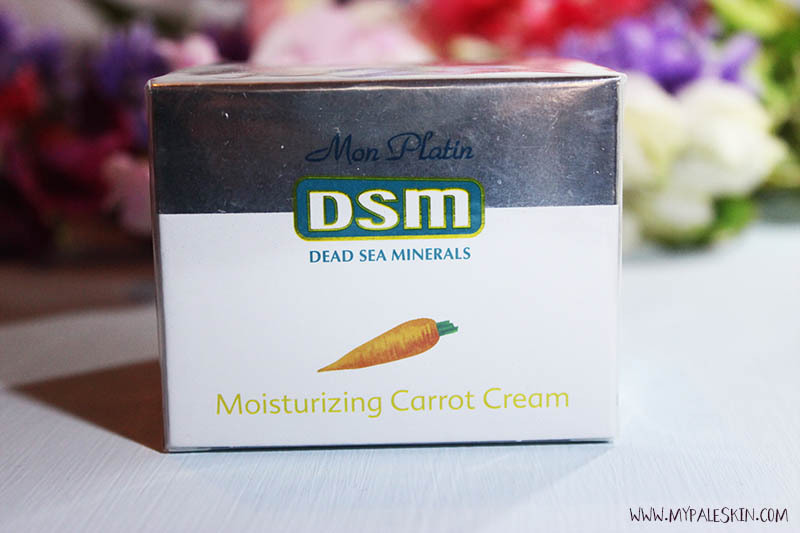 DSM Moisturizing Carrot Cream* can be bought from Jojoba Cosmetics as well as other retailers online. Have you tried a Carrot Cream before? I'd love to hear your thoughts! Note: *This product was provided for free for review purposes. Sounds good and at a great price too. I think you will have to bite the bullet and try Nivea again to see if it is that causing breakouts. I tried 3 new things at once the other week and got breakouts so have had to strip my skincare right back and reintroduce things slowly to find the culprit. I never learn! Moisturizer is a very basic skin step that you can not lack daily. Depending on the age and condition of the skin, each person can choose the appropriate product. 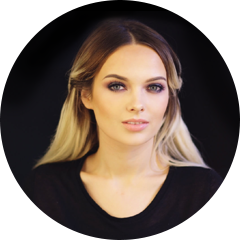 #BLFW Bloggers Love Fashion Week - My Highlights! Mon Plantin Honey & Olive Oil Hair Mask* Review! FOTD - An everyday work look. Nasal Guard Allergie Block* Review!